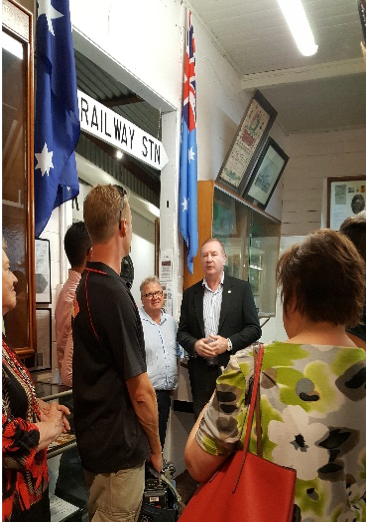 In mid-April, we hosted Stephen Bromhead, State MP, David Gillespie, Federal MP, Members of Wingham RSL Sub-Branch, Members and Guests of MVHS at the launch of Stage 1 of our new War Cabinet display. As part of the commemoration for the Centenary of World War One, we were successful in obtaining a grant under the ANZAC Community Grants Program. This funding was used to facilitate the expansion of our War Cabinet display area. This expansion is in 2 stages. Stage1 takes the form of a ‘Theatres of War’ timeline graphic, whilst Stage 2, which is to be launched in late October 2018, will be a memorial to all who served. Many thanks to all those involved in bringing this new exhibit to fruition. In 1986 the Quota Club of Taree. In 1986 the Quota Club of Taree held a 3-day exhibition of Dame Joan’s Opera gowns. After the Quota Club purchased the book, above, it was put on display at the Manning Entertainment Centre and then later displayed the Greater Taree City Council Chambers. In 2002 Dame Joan visited Taree for the City Festival and attended several functions. She was interviewed at the entertainment Centre by Ian Ross at a special concert called ‘A Conversation with Dame Joan’. In 2004 Dame Joan again attended the Taree City Festival and presented an award from the Greater Taree City Council to opera singer, Kevin Mills. The book ‘Designs for a Prima Donna’ by Richard Bonynge, is on permanent display at the Manning Valley Historical Society Museum and is well worth viewing. Two planter boxes have been installed outside the Museum, by the Wingham Chamber of Commerce. Visitors will now be able to see many of these around the Wingham CBD area. The plantings range from miniature fruit trees, herbs and in our case, floral displays. Museum members are responsible for the care of the plants. 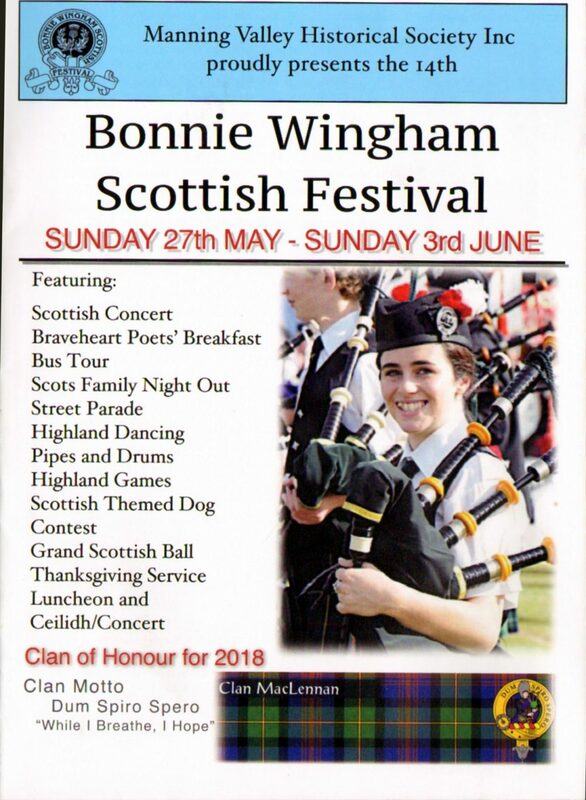 Check our website for event details – Concerts, Genealogy Fair, Bus Tours, Scottish Fun Night, Highland Games, Street Parade, and Grand Scottish Ball. Speakers include: Susan E Boyer, a contemporary Australian author with a passion for colonial history. Rob Tickle, BA in Archaeology, Palaeoanthropology, and History. Topic: The 1818 Expedition by John Oxley and 15 others. 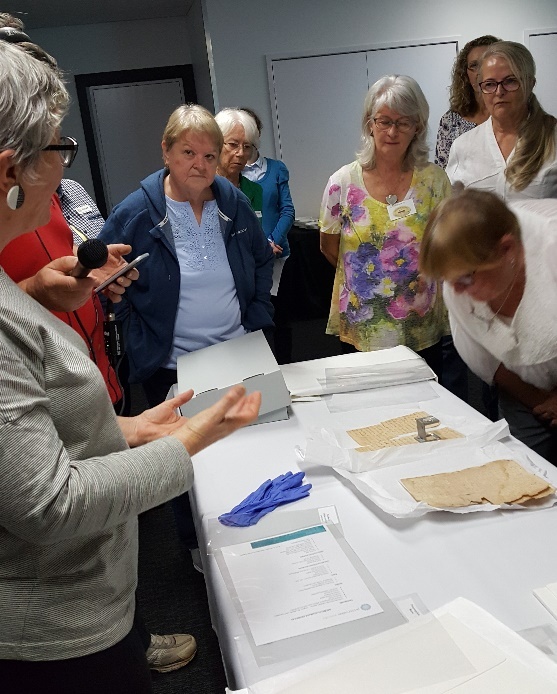 Recently, Port Macquarie member, Debbie Sommers, Museum Chapter President, organised Kay Soderland, Conservator from Preservation Australia, to hold a workshop on the principles of Conservation- ‘Collection Care A-Z’. Topics covered what to do about deteriorating collections and how to safely handle, display and store objects to avoid damage. Collection Care is complex with light, ultra violet radiation, relative humidity, pollutants, pests, mould, storage and handling all factors to be aware of in collection management. People from 12 different organisations attended from Lismore, Tamworth, Camden Haven, Port Macquarie, Wingham, Tinonee, Kempsey, Wauchope & Trial Bay. Kay Soderland (L), discussing some “Do’s and Don’ts “about storage and handling with fragile documents. Ray was born at Hannam Vale and was the 5thof 9 children. His father died at an early age and the family moved to Wauchope. Ray left school at 14 and worked in various jobs in the automotive industry ranging from office manager, coin counter, mechanic,spray painter, & smash repairer. He married Patricia Hanly in 1954. As a ‘one man band’, he also owned and ran Taree Bus Company which he expanded to 7 buses. After retiring in 1982, Ray and Pat went on many road trips around Australia and travelled to Europe, China, Vietnam, Africa, and North & South America. Ray had many interests and was a member of the Taree Historic Motor Club and Taree Local Collectors Club. He volunteered at Manning Valley Historical Society for many years and loved the museum, being involved with maintenance and displays, often bringing his own collection of tins and memorabilia for window displays, donating from his own collection and also assisting with bus trips. 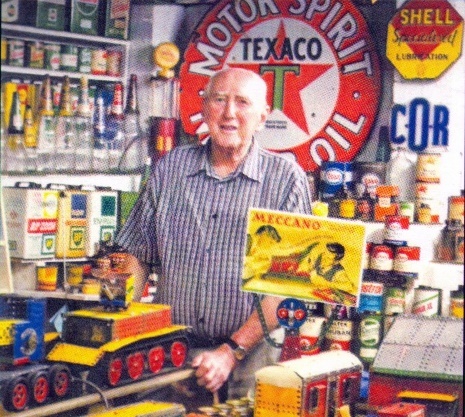 He was a collector extraordinaire, his vast private collection including automobilia, meccano sets, electric trains, model cars & trucks, tobacco & cigarette tins, match boxes, gramophones, radios, biscuit tins – to name a few! 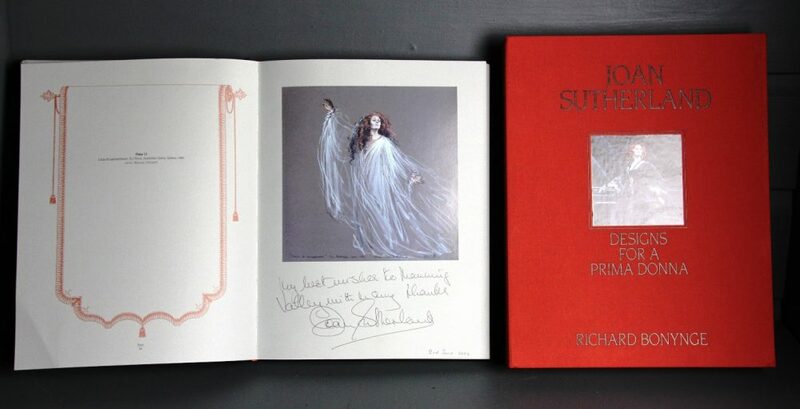 He loved opera and was a keen collector of vinyl records and enjoyed a tour to Opera Houses around the world, even meeting Dame Joan Sutherland in San Francisco where her 60thBirthday was celebrated. Ray was a quiet achiever and a much-loved husband, father, grandfather and friend to many. The following was written by Ray for the MVHS November 1989 Journal. 1877 Thomas Edison invented the first machine for playing a record as well as making the record. The very first recording was made by Edison himself by reciting the lines “Mary had a little lamb”. Heused a metal cylinder that rotated on a long screw which was cranked by hand, this cylinder was wrapped in tin foil. Then came the disc in 1887 invented by an American, Emile Berliner born in Hanover, Germany in 1851. They were seven inches in size. He called his device to play a disc on “THE GRAMOPHONE”. In 1896, Eldridge Johnson designed a wind-upmotor and supplied these to Berliner. Ayear later Johnson produced an improved Gramophone which used a better motor and sound box. This particular machine, by the way, is the familiar one used with the trade mark picture of the dog listening to “HIS MASTER’S VOICE”. In 1901 Johnson and Berliner merged their interests to form the Victor Talking Machine Company. 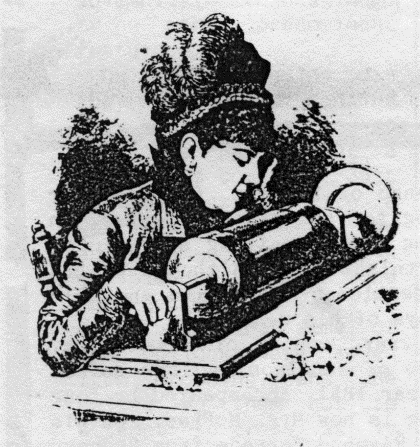 Vertical recording on wax cylinders continued alongside the lateral recording on shellac disc for some time, but the cylinder gradually lost ground. For many years, the classical singers refused to have their voices recorded, however in 1902 Enrico Caruso the great Italian tenor became fascinated by the possibilities of the Gramophone and was the first singer in the world to record and sell one million records. 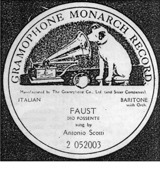 Did Caruso make the Gramophone or did the Gramophone make Caruso? Hand cranked aria. An opera singer demonstrates how a recording was made in 1878. She cranks the handle and sings and would have to repeat the song for every copy of the recording. Up until 1924 all records were single sided. Caruso and Melba only made on record together and that was on a single sided, “Oh Lovely Maiden” from Puccini’s La Boheme (which is a collector’s item today), although they performed on stage quite often. Records in those days always had black labels but Melba insisted on having a colour of her own – the famous lilac was born. Discs or records as we ca11 them, improved after 1925, when Victor came up with electric recording equipment. Many other famous artists followed suit and this assured the success of the Gramophone industry. Some of these early cylinders and records are preserved in private collections and museums. Collecting old recordings is a fascinating hobby.